This year’s AGC Triple Crown Challenge (TCC) took place in Worthy Down, Winchester on 11 May 15. The annual event which is normally held in May is designed to individual team’s military skills and battle fitness within a competitive environment. The event was divided into two parts: 12 Mile March and Shoot and the Military Skills. 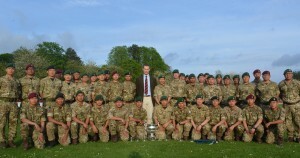 There were 128 AGC teams in total, who competed for the Corps trophy. Likewise, a total of six teams from Gurkha Staff and Personnel Support (GSPS) took part in the 12 Miles March and Shoot competition for the Col Comd Bde of Gurkhas trophy. 2 RGR successfully became this year’s winner and the GSPS North Team (2 ITB Catterick and York) were the runners’ up. Comd Home Command, Lt Gen James Bashall CBE presented the prizes to the winning teams. There was a photo opportunity for the teams with Col GSPS, Brig Paul Burns and OC GSPS, Maj Surya Rai. The day’s event concluded with a BBQ and entertainment later in the evening.